Welcome to the Cupcake Inspirations 200th Challenge blog hop and celebration! You should have arrived here from the Cupcake Inspirations Challenge blog. If you happen to get lost along the way, please remember that you can always scoot on back to the CIC blog to find a complete list of blogs in the hop. You are in for a treat today! To thank you for celebrating with us, the Cupcake Inspirations Challenge team and partners are offering two ways to win fabulous prizes. Read on for all of the details. Win the grand prize valued at over $200 for playing along in the Cupcake Inspiration Challenge #200 - Pick Your Favorite Challenge. Visit the Cupcake Inspirations Blog for all of the details. To join in the challenge, you'll be selecting your favorite past Cupcake Inspirations Photo and making a creation based on it. I picked my favorite photo from challenge #100, shown above. Then I made the card shown above based on the inspiration photo, using several products from the Echo Park Summer Days collection. It's that easy, friends! 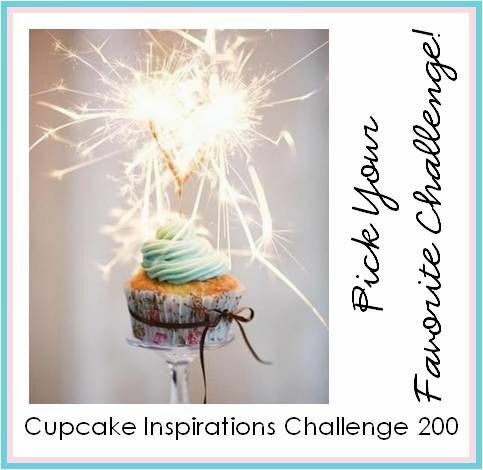 We are excited to be sponsoring Cupcake Inspiration's 200th Challenge. You can view our entire class list on our website at My Creative Classroom. You can also view classes on our Facebook Page too! One lucky winner will receive a free seat to a class of their choice.....Good Luck! Whew...that was quite a lot of information for one little old blog post. There are so many fabulous creations waiting for you along the Blog Hop. It's time for you to hop on over to Chris's blog and see what she has in store for you. Darling card Anita. I love how cheery it is. - I'm part of the hop so leave my name out when you pick a winner. Oh wow this is an awesome creative take on the cupcake inspiration. Love the cheerful colours. Merily hopping along. Anita, I'm so glad you played along with the Sweeties for this challenge. Your card is great, it's so upbeat and fun, I love the color scheme. so cute, luv this card...I'm part of the hop....have a fabulous day! Nice n bright card...love it! This is wonderful. I love the dimension to it. Great take on the cupcake! How fun and colorful. I love the papers that you use. Awesome card. Like the Spring feel in colors & the 3D dimension look to this. My daughter likes roller coasters. Last mth I went to DisneyLand and rode the Indiana Jones ride that is somewhat of a roller coaster ride, in a jeep vehicle and it was jerky at times but fun. Your card is so cheerful and encouraging. Love the sentiment and the amazing roller coaster! Your card is so pretty! Thanks for the opportunity to win!!! I love your interpretation of this photo! So vibrant and FUN! Love your card! It's so colorful and fun! I love the colors you used. It looks so summery. Love your card, bright and sunny! Love your card!! Makes me ready for Spring to get here!! What a great card. I love the bright colors and fun scene. Wow, what a colorful fun card! 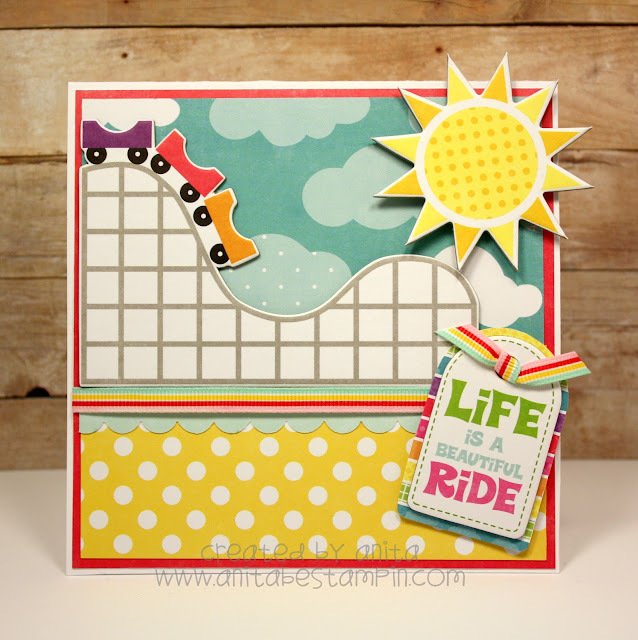 Anita your card is so fun and cheerful, it sure brighten my day! Thanks for a chance to win a spot in your class! Oh my goodness. What a bright and cheerful card. I am in LOVE with this. Love this card! So colorful and really clean and smooth! Awesome card. Love the sentiment. Super nice card and such a great take on the cupcakes. I LOVE all the colors and patterns in your fun card! Love this fun and happy creation! Great card. The papers you chose go great with the CIC you picked. Beautifull! So colourfull, i like it so much! Such a pretty and happy card, love your interpertation of the cupcakes. Such a cute card! It makes me long for summer days LOL! Your card is sooo cute!!! LOVE the colors, soft pastels!! Thanks so much for sharing your talent with all of us!! What a bright and cheery card!! Goes perfectly with your inspiration cupcakes. The recipient will love it. Beautiful Card.i love this hop.Thanks for sharing. Great card! So fun! The class giveaway sounds great too. Super happy card! Love the sunshine! Such a fun card Anita. 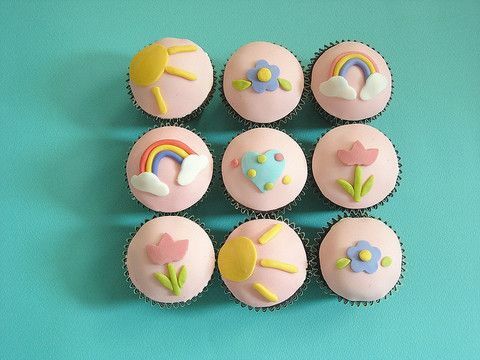 Perfect make for your cupcake inspiration picture. What a fun spring card. Great job. Anita- This card is screaming Summer!! I love the scene you created and love the bright colored paper. Thank you for the inspiration. what a fun and happy card! I love it! Thanks so much!